Outfitted in Rosso Corsa Red on Cuoio Natural Tan Interior. This vehicle came out of a private collection, and has been meticulously maintained and cared for under tender and in a climate controlled environment. 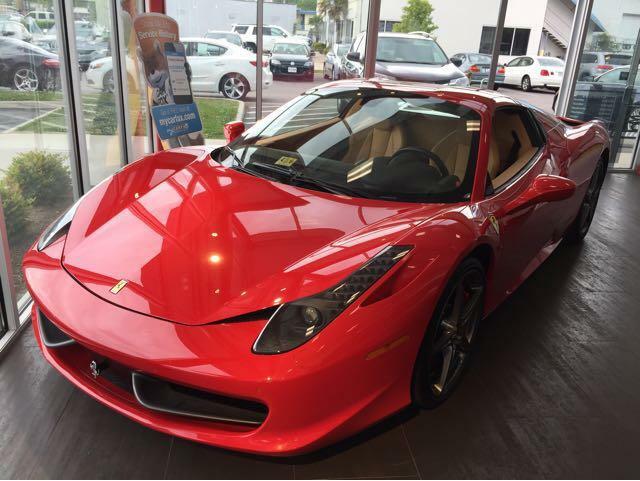 This beautiful 458 Italia features options like: front axle lift, front and rear parking sensors, 20in Ferrari Sport Wheels (Dark Finish), Red Brakes, Ceramic Brakes, JBL Sound System and Scuderia Shields! This vehicle has just recently received its due service through Ferrari. Tires are brand new. It comes with the 7 year FREE maintenance through FERRARI. Message: Thought you might be interested in this 2012 Ferrari 458.